This is a great recipe to use up your leftover meat from the Christmas dinner. 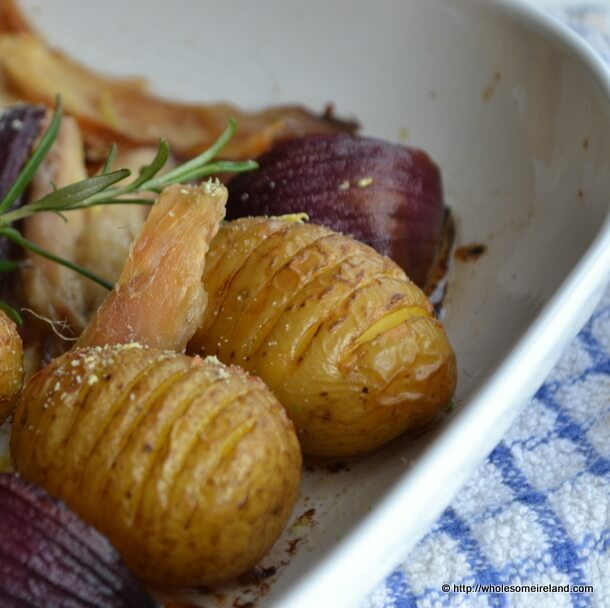 This is a tray bake that can be lifted from plain and simple eating (not a bad thing after Christmas excess) to a meal with a zing from some flavoured salt. Turkey and ham are staples on our dinner-table on Christmas Day. Yet when the main meal has been cleared away there is still a turkey to break down, stock to be made and the ham to be divided into portions. There is always leftovers. The generosity on the day itself led, last year, to me having over 20 meals worth of cooked meat in the freezer for the weeks beyond. 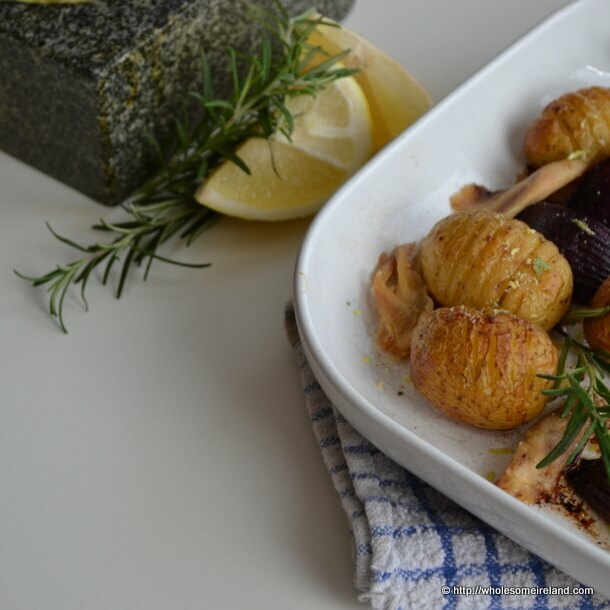 While we all love turkey and ham there are only so many times we’re happy to eat a classic roast dinner and yet I don’t fancy having to be too inventive in the kitchen with leftovers because I prefer not to make work for myself. This flavoured salt theoretically should keep until Christmas if you make it now and keep it in a clean dry jar. 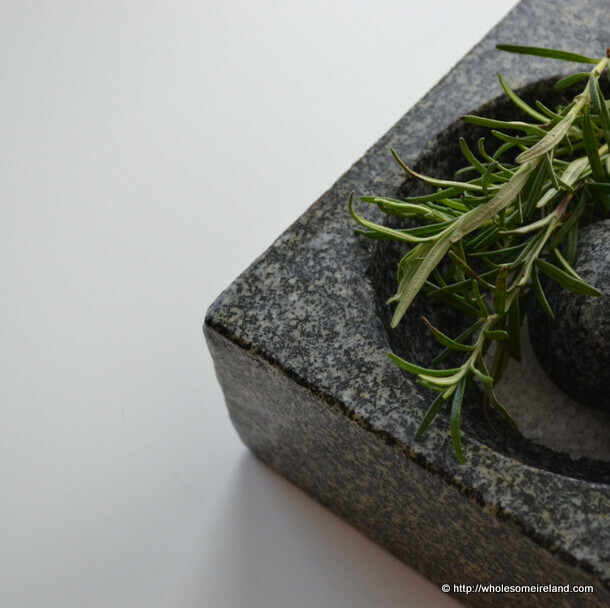 Put the salt into a heavy pestle & mortar, add the leaves only from the rosemary stalks. Grind well. 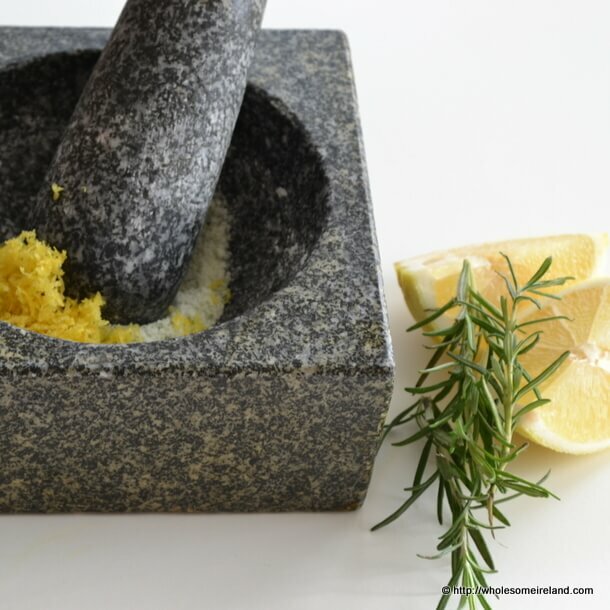 Stir in the fresh rind of the lemon. Spread out the ground salt on a flat surface lined with baking paper and leave in a warm dry spot. I used the oven after cooking dinner a few nights back. I left the salt in the cooling temp of the oven overnight and it dried out a good bit. Store in a dry container with a tight seal on the lid. 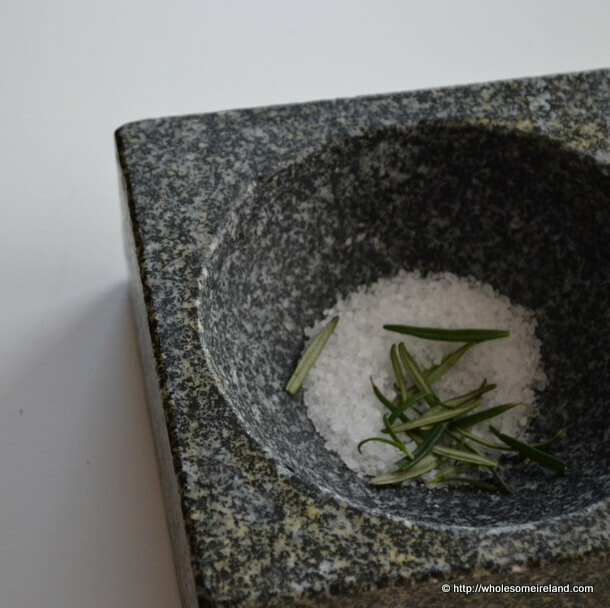 Sprinkle as flavouring on your meal or bread of choice. And so to the tray-bake. Preheat your (fan) oven to 180 degrees Celcius. Take a large ovenproof dish and pour the oil into the bottom. Slice the potatoes to 2cm from the bottom, Cut the onions into quarters. Toss the potatoes and onions in the oil then reposition so that the cut sides of the potatoes faces upwards. Put the ovenproof dish into the oven for 40 minutes. After 40 minutes, remove from the oven and add the turkey meat. Gently stir so that they are coated in the cooking oil and won’t stick to the dish. Return the dish to the oven for a further 15 minutes. Serve immediately with a light sprinkling of the flavoured salt and a side salad or steamed vegetables of your choice. Sounds FABULOUS! And so simple. Thank you! Thank you Sunnyscattered. I’m all about simple! Enjoy! 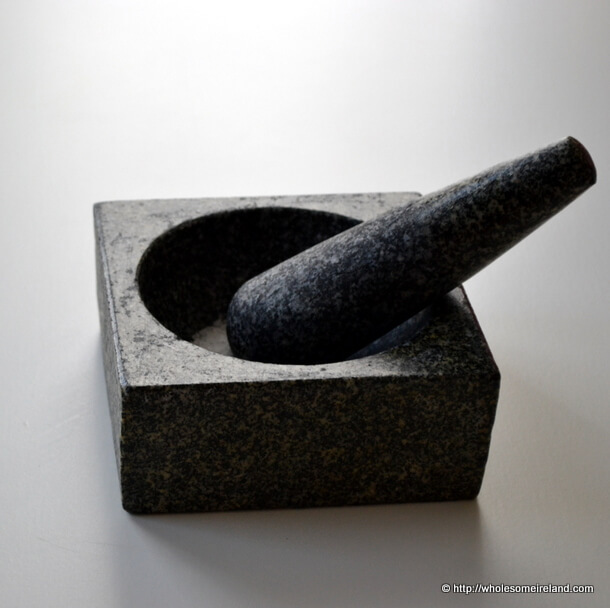 Love your pestle & mortar! Thanks for the recipe. Hi CatherineAnn – once cooked through and cooled to room temperature I portion off the meat into meal portions, wrap and freeze. I then remove the meal portions from the freezer per meal, defrost and heat through thoroughly before serving. I hope that helps you! That’s a great help, thanks! I’ll definitely do that this year.